Indian mythology poster of the old Bollywood movie Sati Naag Kanya (1956) for sale. 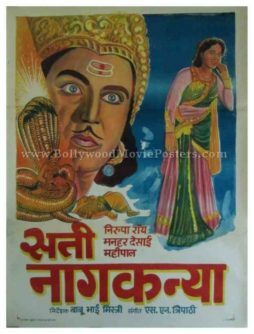 This is an actual surviving vintage Indian mythology movie poster of the 1956 Hindi film that was directed by the pioneer of special effects in Indian cinema, Babubhai Mistri. Printed and circulated a few years after the first release of the film (somewhere in the late 1960s or early 1970s), this Hindu mythology poster was printed for publicity of the re-release of the film but never ended up being used. This hand drawn Indian mythology poster was originally designed in oil on canvas format by a small time art studio in Delhi. The artwork created by Bollywood poster painter O.P. Bangali gives this vintage Indian mythology poster a very quirky feel. The snake woman is seen seated on a giant cobra holding a severed human head on her lap, suggesting the mythological theme of the film.